Back to the usual shenanigans for the GMen who can’t quite figure out one week from another. 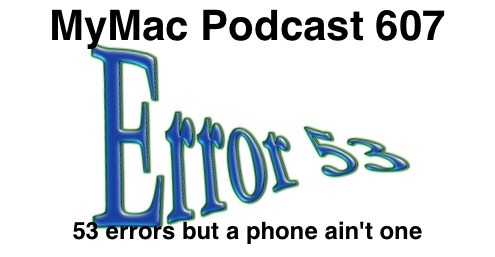 Then they talk about the ongoing saga of the dreaded Error 53 that some people who have had their iPhone parts replaced and whether Apple’s seemingly lack of focus could be to blame. Guy’s App Pick: Lightworks by EditShare. A nearly fully featured non-linear video editor that has a quirky interface and some similarities to Final Cut Pro for free? How is it possible? Well they give you some, but not all of the potential features and hold some back like user-defined project locations,sharing, advanced hardware support, and the pro version includes some pretty cool Boris FX stuff, and only exports to MPEG-4. All this is to naturally entice you to their subscription-based (hate this trend in software) Pro version. People’s Pick: Want to measure how big something is on your Mac screen, in pixels? Press Cmd-Shift-4 to start a partial screen capture. The mouse pointer turns into a cross-hair and shows its current screen coordinate. Move to one corner of the part of you screen you want to measure, then drag to the opposite corner. The pointer shows you the dimensions of the box in pixels. If your start position was a little off, hold down the spacebar while continuing to drag to move the first corner. To cancel, press Escape before letting go of the drag, or just let go of the drag to capture a PNG image of the area.